Awesome product.fast shipping.Perfect description.More sellers like this. Fast Shipping, great product at great price. Product exactly as described. Needed repair... but works fine now.. fast ship. Great blower. I had to replace a trustworthy 10 yr old Ryobi and immediately went for the Husqvarna as I have weed hackers and chin saws belonging to Husqvarna which all rn stellar. The blower was no exception to that reliability. Easy to get assembled, easy start, great power and volume. A definite recommend. I received this product almost two weeks ago and stated I would update my feedback in two weeks after using the Husqvarna leaf sweeper. Well, beyond all my expectations this is the top of the line yard tool for the residential owner it operates like a commercial machine and is so easy to prime, start and work for hours. I have an acre of landscaped property with over seventy trees and you can visualize the amount of leaf cleanup we have at this time of year. This machine has done it's job and more importantly made mine so much easier. I highly recommend this machine to anybody that has the need of a powerful yard sweeper for there home or small business. 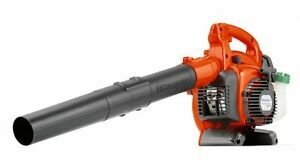 I was looking for a high quality, reliable and cheap gas leaf blower so I bought this one and I was amazed how easy, powerful and reliable this blower is. I really fell love with it. I HIGHLY RECOMMENDED this to anyone looking for cheap, high quality and reliable blower. You WILL NEVER BE DISAPPOINTED. I know for sure that I will use it for many years to come. Luv it. 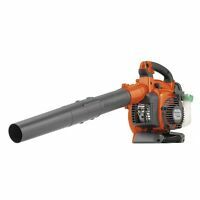 Purchased this Husqvarna Leaf Blower as a gift for my husband. He started using it 3 days after receiving it. Perfect for blowing off the lawnmower after mowing the lawn - which keeps the mower in much better working condition. Did a great job blowing leaves & pine straw from driveway and walkways. Love it's lightweight body, ease of handling and power of the unit.